"e;Remember the words of Ivan Rogers the next time you hear some plausible posh boy in a suit telling you 'no deal' wouldn't hurt at all and might even be a jolly good thing. 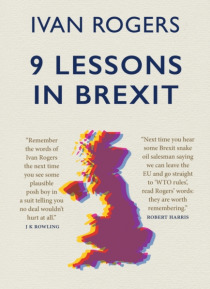 "e; J.K. RowlingTwo and a half years after Britain voted to leave the European Union, the political debate over Brexit seems as intense and as complicated as ever. Who and what can we trust? And how on earth do we mak… e sense of it all?Ivan Rogers, the UK's former ambassador to the EU, is uniquely placed to tell some home truths about the failure of the British political class and the flaws, dishonesty and confusion inherent in the UK's approach to Brexit so far.In this short, elegant essay, Rogers draws up nine lessons that we, as a soon-to-be 'third country', need to learn from the last few years, if the next few years - indeed the next decade - are not to be even more painful.